In keeping with the motto E-MOBILITY IS THE NEW NORMAL, vehicles will be able to do much more than just drive electric in the future. Over the next few years, the BMW Group will be concentrating not only on strengthening sustainable mobility, but also on expanding additional technological competencies. Highly autonomous and partially autonomous vehicles will be key technologies for future mobility. Connecting people, vehicles and services plays an increasingly important role and is impacting all areas. Even the design has to reflect these new fields of innovation, by creating a new look for sheer driving pleasure. These visions will go into series production in the new BMW iNEXT from 2021. The first highly autonomous vehicle in the BMW fleet combines a future-proof, scalable and modular system with ground-breaking innovations. Using high-precision maps, sensors, cloud technology and artificial intelligence, the vehicle is in constant communication with the driver and their surroundings. As the technological spearhead of the BMW Group, the BMW i brand will continue to open up new technologies and services relating to mobility. The BMW iNEXT takes individual premium mobility to a level previously unheard of. 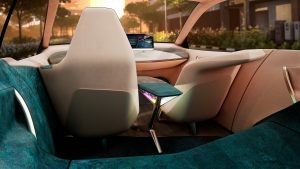 This car will set new standards with highly autonomous driving and digital connectivity, as well as its futuristic design and intelligent lightweight construction. Fitted with the next and newest generation of electric drive trains, the BMW iNEXT offers customers a new and fascinating mobility experience, where the technology remains in the background, virtually out of sight. Vehicle functions can also be operated via surfaces, e.g. by touching the wood in the center console or the Jacquard cloth of the rear seating. In this way, vehicle operation is completely geared towards the driver’s needs. This will be an important element in every new BMW Group model going forward. This past October, BMW was at the LA Autoshow, where you could see the BMW iNext concept. This video gives a great recap of what BMW is trying to achieve with level three autonomy. This means you can drive on the freeway, take your eyes and hands off the wheel road.